The Coin Collection, now a distinct collection of the museum, contains all coin finds from the territory of Aquincum. At the Aquincum Museum until the 1960s all coins found during excavations, rescue excavations or acquired through purchase – except for those taken to the Hungarian National Museum – were recorded in dedicated inventories and held separately from other finds. Later on, coins found during excavations were catalogued and kept together with other finds in the ‘archaeological small finds collection’. Only a few coins, obtained through purchase or donations, were held in the coin collection. Nowadays, the practice continues when it comes to the inventories, but following identification coin finds are now stored separately in the Coin Collection. This makes it easier to store the delicate finds and more convenient to study the material. 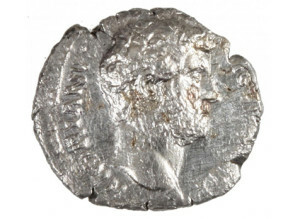 Coins minted by the Roman emperors could remain theoretically always in circulation. Nevertheless, the replacement of worn coins with newly-minted ones went on continuously, as did the debasement of the currency. We can tell when the various coins were issued based on the emperor portrait and legend they feature. This makes the dating of archaeological finds much easier and also provides information concerning coin circulation and changes in the economy of the province and Aquincum. The Coin Collection contains a number of coin hoards. In addition to the hoards – primarily of denarii – from Laktanya Street and Selmeci Street we know of further finds of 3rd and 4th century coins from the Civil Town. The contents of hoards can give us clues not only about the state of the economy at the time, but also the social status of those who buried their treasures.